I’m posting today from Newburgh, New York – my hometown – which makes today’s SotW especially appropriate. When I was a kid, growing up in Newburgh, my dad owned and operated a roller skating rink called the Avalon. Occasionally the building would be used to promote special events like professional wrestling (I remember Bruno Sammartino, Haystacks Calhoun and Gorilla Monsoon) and concerts. 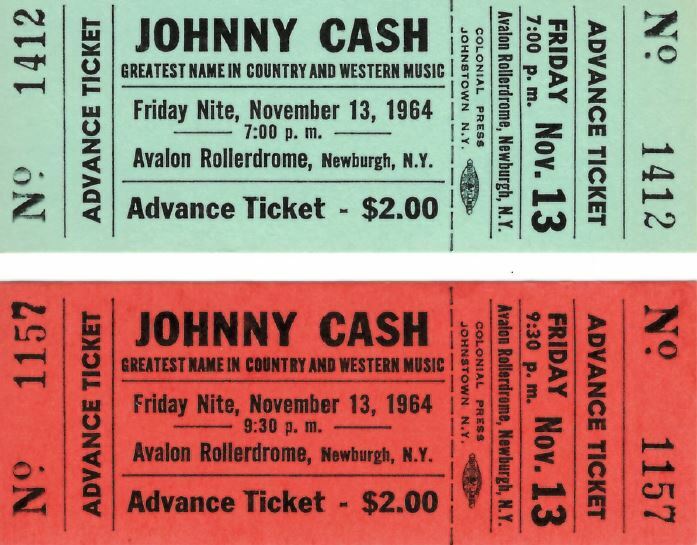 It turns out Cash did two shows that night – 7:00 and 9:30. In November ’64, he would have been at the tail end of promoting his I Walk the Line album (released in May 1964) and starting to promote Bitter Tears (October 1964). One of the songs he must have played would have been “Understand Your Man” which held the #1 spot on the Billboard Country Charts for six weeks in the spring of ‘64. As you listen to “Understand…” you will undoubtedly hear the resemblance to Bob Dylan’s “Don’t Think Twice, It’s All Right.” This should be no surprise. Cash and Dylan were connected from the earliest days. They both listened to and respected each other’s music. They first met at the Gaslight in 1963 and again at the Newport Folk Festival in 1964. Cash openly admitted morphing “Don’t’ Think Twice…” into “Understand…” He kept most of the melody, and lyrically turned another one of Dylan’s many put down songs into a Cash styled “my way or the highway” rant. You can check them out on to decide for yourself if the lineage holds up. Apparently there is a recording of a medley Cash and Dylan did of their two songs. I have a bootleg of their session together but it doesn’t include the medley. Darn! “Understand Your Man” was the last song Cash ever performed in public, at the Carter Family Fold, Hiltons, VA on July 5, 2003. Excuse me, isn’t this “Don’t Think Twice”? This song cops Don’t Think Twice, or a part of it, but it is also rabid with anger. The value of the song comes from how mad it is. Otherwise it is a different song.